We’ll resolve any noise abatement challenge, no matter how complex. Kimpton Acoustic Engineering offers market-leading expertise in all aspects of acoustic enclosures, acoustic design services and noise control. Our team of designers and engineers offer a wide range of noise management products. Our Acoustic Engineering service supplies a wide variety of clients and sectors including power generation, power transmission and distributors, industrial, commercial and healthcare sectors. We work closely with our customers to identify specific problems and develop appropriate, bespoke noise management products and solutions designed to tackle any industrial or commercial environment where noise pollution is a factor. No matter how complex the challenge, or whatever the industry, our acoustic engineers have the experience to resolve any noise control problems. 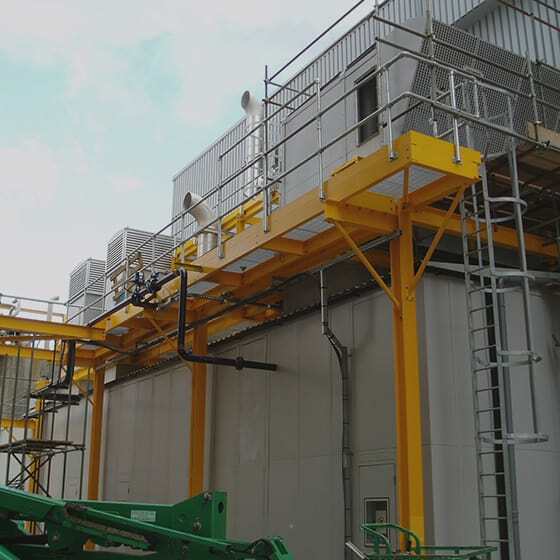 As part of the Kimpton Energy Solutions group, with over 50 years experience in essential building services – Involved in the design, manufacture, installation and maintenance of a broad range of bespoke acoustic engineering products. Our success is based upon this industry experience and a dedicated team of highly skilled technicians utilising the latest design technology. At Kimpton Acoustic, we understand that the problem of environmental noise pollution, machine noise and acoustic performance in the workplace is an increasingly important health and safety issue. A large increase in both onshore and offshore wind farms has created the need for large-scale electrical transformers, which are in turn, increasing the background noise levels where installed. Left out in the open, these can become a serious noise pollutant. All this means that there is a growing need for expert acoustic engineering services. Kimpton Acoustic Engineers can advise on noise control standards and help you assess your noise management requirements. Then we can recommend the best approach for you, plus design and deliver a complete noise abatement solution that answers all your specific requirements.